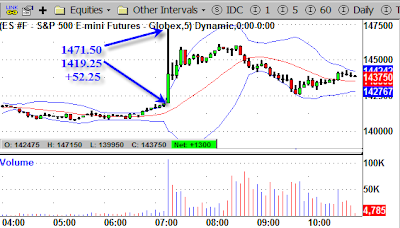 The Fed officially eased today in a surprise discount rate cut that sent futures soaring. The Federal Reserve, declaring that increased economic uncertainty poses risks for U.S. business growth, announced Friday that it has approved a half-percentage point cut in its discount rate on loans to banks. The action was the most dramatic effort yet by the central bank to restore calm to global financial markets which have been roiled in the past week by a widening credit crisis. The decision means that the discount rate, the interest rate that the Fed charges to make direct loans to banks will be lowered to 5.75 per cent, down from 6.25 per cent. The Fed did not change its target for the more important federal funds rate, which has remained at 5.25 per cent for more than a year. Many economists have been calling for the Fed to move to cut the target for the federal funds rate, which has been at 5.25 per cent since June 2006. The discount rate covers only loans that the Fed makes directly to banks. But the funds rate covers all loans that banks make to each other on a short-term basis. It is much more critical in determining interest rates in the economy such as banks' prime lending rate. The nation's once high-flying housing market is sinking deeper into gloom, and credit, the lifeblood of the economy, is drying up. Many economists believe these problems, including declining consumer confidence, could lead to a recession. Since setting a record close of 14,000.41 just a month ago, the Dow Jones industrial average has shed 1,154.63 points in a string of triple-digit losing days that have raised anxiety levels not just on Wall Street but on Main Street as well. Countrywide Financial Corp., the nation's largest mortgage banker, was forced to borrow $11.5 billion on Thursday so it could keep making home loans. It was a move that rattled investors who have watched a number of smaller mortgage companies go under because of credit problems. The shockwaves have extended to giant Wall Street investment firms such as Goldman Sachs, which announced earlier this week that it was pumping $2 billion into one of its struggling hedge funds. BNP Paribas, France's largest bank, last week froze three funds that had invested in the troubled U.S. mortgage market. For more clues on the fake transparency of Bernanke, notice how he is sticking with his misguided belief silly story that the economy will "expand at a moderate pace". 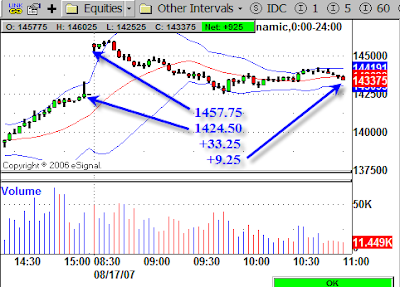 The plunge at the short end of the curve continues unabated as the following chart shows. The bottom to top swing was +72 points. That's a lot of fireworks. At the low yesterday Countrywide hit $15 at today's high Countrywide hit $24. This is panic short covering. But did anything change? 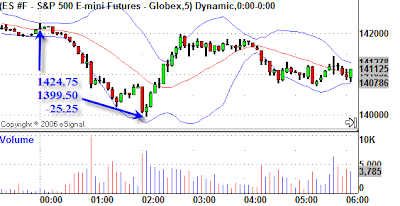 Did the fundamentals of Countrywide change overnight? And once again the Fed refuses to let the free market work. Bernanke is no better than Greenspan. He proved it today. And the moral hazard of the Fed's actions are if anything likely to accelerate. But they won't work. Here is the key: There is both a decreasing demand for credit and a decreasing willingness to extend it. But there is a hell of a lot of pent up demand for cash. To understand the difference, please see Sudden Demand For Cash. The psychology towards risk has changed and that is why Bernanke is doomed to fail. He can either let the free markets work, or he can risk letting this play out over 18 years like Japan did. Given his misguided beliefs about the cause of the great depression (more on that in a future post), his path is already laid out. As for today, a lot of short covering fuel was erased in one fell swoop. But for all those fireworks (as spectacular as they were), the DOW is a mere +120 vs. yesterday. And there is nothing but a huge air pocket below, with economic fundamentals worsening every single day. ..... Fed officials hope that reducing the penalty rate associated with the window and lengthening the term of loans to 30 days from one further lifts the stigma and gives it a tool to supplement open market operations for reliquefying markets. Open market operations, under which the Fed buys and sells securities to adjust the supply of bank reserves and keep the federal funds rate on target, primarily operate through a network of primary dealers, some of whom are large banks. Thus, they have only indirect impact as a supply of funds for the thousands of banks that are not active in the money market. The discount window however is available to any bank or thrift, and the terms are easier than for fed funds loans. For example, banks may submit mortgage loans, including subprime loans that aren’t impaired, as collateral, and many probably will. The article points out how anemic discount lending really is: "Discount lending averaged just $11 million in the week ended Aug. 15. Although that was up from $1 million in the prior week it was puny compared to the billions of dollars the Fed has regularly injected into the financial system through open market operations." The key change is the lengthening of the loan duration from overnight to 30 days. 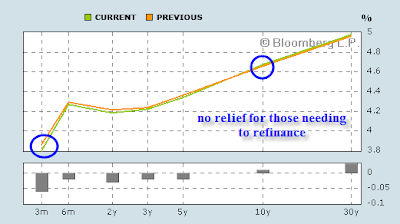 In reality the Fed did little more than put a Bandaid on a failing dike hoping to shore things up.